Pub just a little to the south of Piccadilly, in St James's. It's quite small inside, dimly lit and cosy. The decor is all dark wood and burgundy upholstery - even the ceiling is burgundy. It has a fairly traditional feel, making the large flatscreen perched in a corner look somewhat incongruous (though it was switched off on the visit described below). There are three small tables by the front, served by a well-worn leather banquette under the window, and one more at the back, as well as couple squeezed in alongside the bar. Outside on the street are some small benches, though no tables. There are also narrow shelves in the passage alongside and in the courtyard out back, with three or four spindly stools for seating. On a Thursday afternoon in July 2008 there were a fair few other customers, even at 4pm; a mix of small groups and people on their own reading the paper. It was much the same on a Bank Holiday Monday in May 2009, with one or two tourists and some other local workers. Beers available in May 2009 were Deuchars IPA, London Pride, and Bombardier. 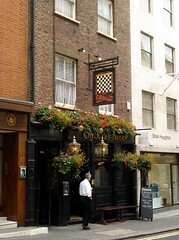 In July 2008, apart from Deuchars, they were Adnams Bitter (£1.55/half), and Courage Directors. Nobby's Nuts were 80p on the latter visit. Kake heard another customer inquire about food - no proper food in the afternoon, but toasted sandwiches (listed on a blackboard; all around £4) and baguettes (also all around £4) were available. A blackboard outside listed what I assume were specials - hot pork baguette with apple sauce and chips (£4.25), salt beef baguette with chips (£5.25), sweet and sour chicken, and lamb madras (the latter two both served with rice and naan bread, and both £6). There's another board inside with space for a soup, pie, and roast of the day. Accessibility: Step up to get in; bar and seating area on one level, but toilets downstairs. Also not a huge amount of room to manoeuvre. Last visited by Ewan, Jo and others, 25 May 2009. Last edited 2011-06-26 14:12:30 (version 5; diff). List all versions. Page last edited 2011-06-26 14:12:30 (version 5).